As I mentioned in the previous post, I want to draw on my recently created reference collection to do an in-depth consideration of some of the styles of boot that I’ve touched on in earlier posts. 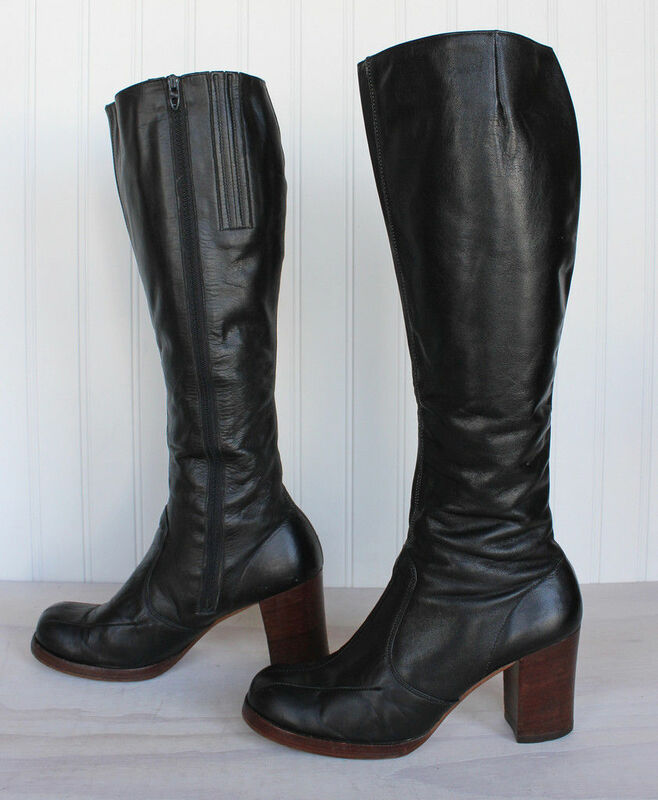 For the first of these, I’m looking at the pair that I’ve assigned catalog # 2013.12.002, a pair of black leather boots purchased via eBay. 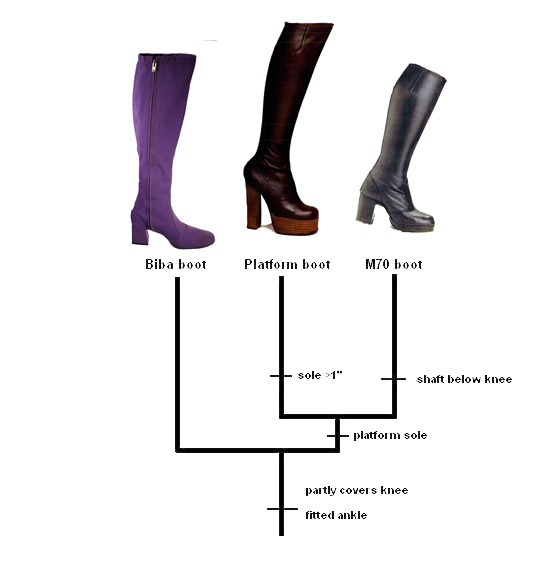 If you’ve been reading this blog for a while, you’ll remember that back when I was reconstructing an evolutionary “tree” for the fashion boot, I identified a small group of related boot styles – a family, if you like – which has its origins at the beginning of the 1970s. This group includes both the iconic suede boots produced by the London store Biba and the platform boots that were popular in the early to middle years of the decades. Both these styles are well-documented and can be found in the on-line costume collections of major museums. Less well known now, but far more commonplace during this period, was the third style contained within the group, which for want of a better name I’m calling the Mid-70s (or M70) boot. 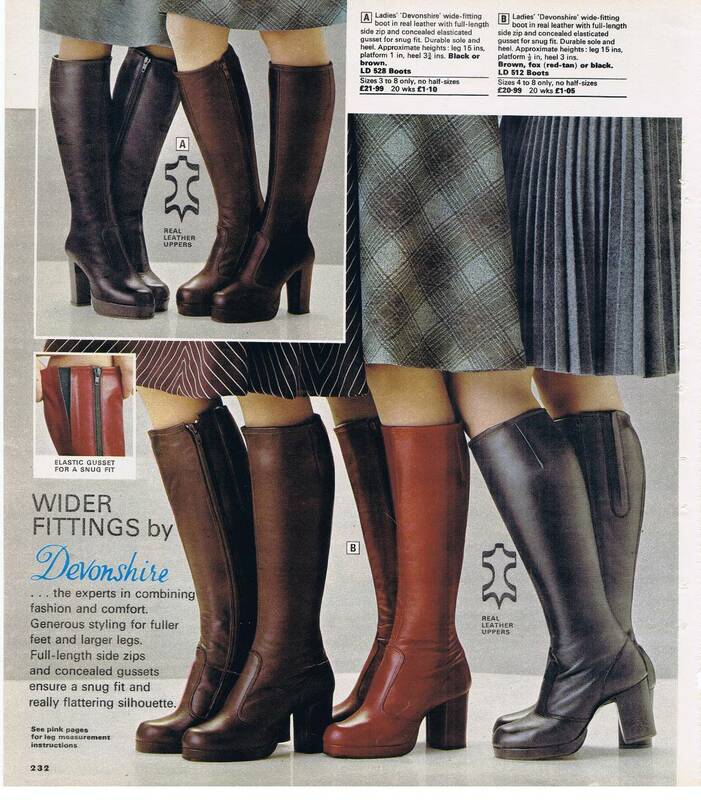 If you look at mail-order catalogs for the middle years of the seventies – say 1974-1977 – this is probably the commonest style of boot. Since I didn’t have “type” specimen for the style in the various collections I’ve been drawing on, I decided I needed to acquire a pair. Fortunately, as ever, eBay came to my aid with this very reasonably priced pair, which were apparently made in Brazil. I don’t have more of a provenance than that, but there are a number of features that very definitely place these boots in that mid-70s period. The first thing that strikes you when you look at them is how small they are. My wife, who is a petite woman, took one look and declared that there was no way she could get into them, despite their being notionally her size. The ankle is unforgivingly tight and the shaft has been folded and stitched (pleated?) at the top to give them a wicked curve that is only partly relieved by having a very long. elasticated gusset on the inner surface of the shaft. 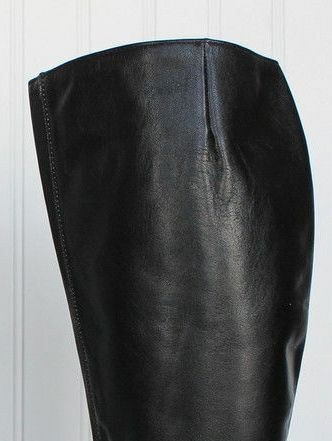 These are absolutely a young woman’s boots and they reflect the comment that I quoted a few posts back from the “Kaschia from Sacha” blog post about having to stretch boots in the back of the store to make them fit. The next thing you notice is that these are very definitely platform boots, but that the sole is much thinner than the classic platform boot of the period. For the purpose of the tree study, I classed platform boots as having a sole that was greater than an inch in thickness. This seems to hold up. Another feature of the sole and heel is that they are made from laminated layers of wood, built up to provide both the platform sole and a high, stacked heel. 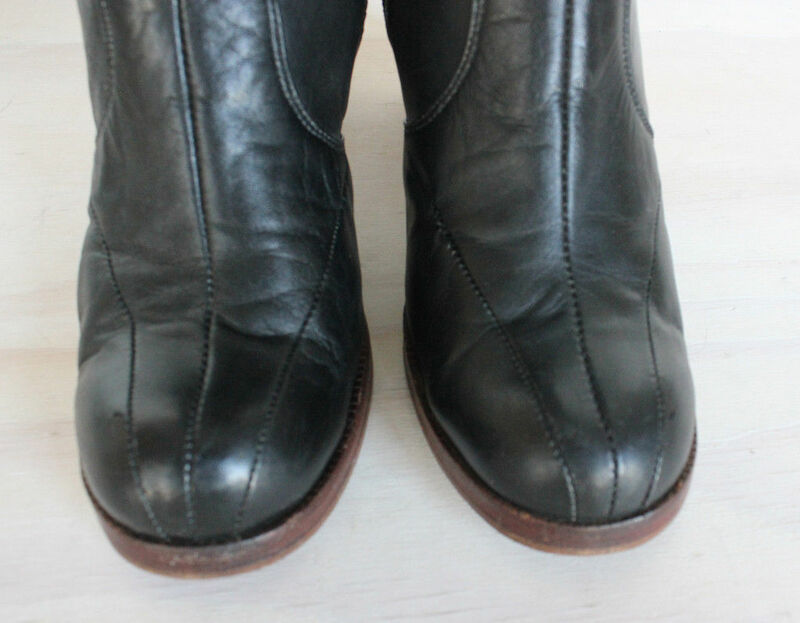 These contrasting wooden accents were another distinctive feature of boots from this period; most boots before and afterwards had soles and heels which were made from the same material as the uppers. 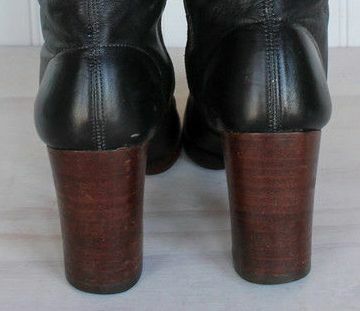 Today, wooden heels are more of a novelty, used to give the boots a retro feel. 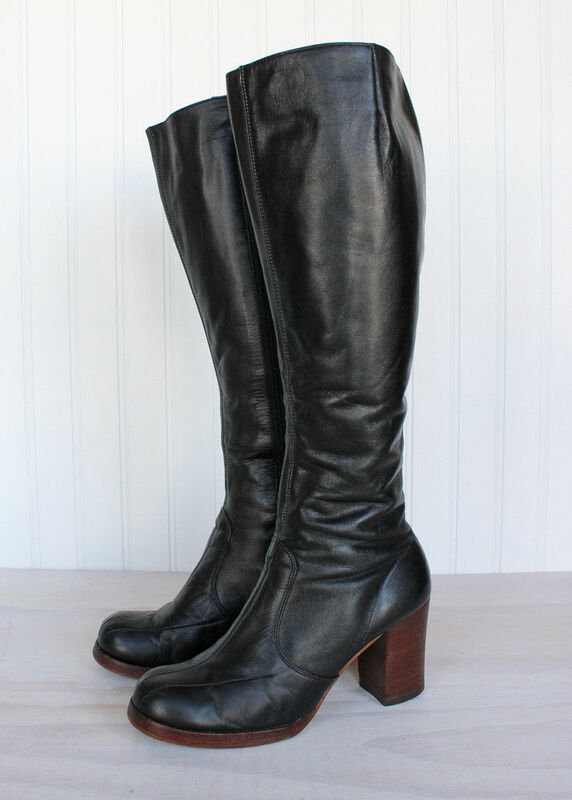 The toe of the boot is rounded – again, this says first half of the seventies. Before and after, boots tended to have more of a pointed toe, as they do today. 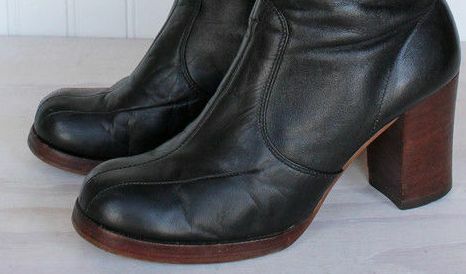 The round toe was seen in both shoes and boots from early to mid 1970s, and reflects the more “organic” or “rustic” design ethos of the seventies, compared to the “space age” vibe of the sixties and the overt modernism of the eighties. Round-toed boots are quite rare today, even in styles that are consciously retro.